There are two new titles that dance lovers can start adding to their book collections this month, Compagnie_Marie_Chouinard_Company, and the soon-to-be-released Fields in Motion: Ethnography in the Worlds of Dance. Compagnie_Marie_Chouinard_Company is the first bilingual monograph of a Canadian contemporary dance company. Written by the choreographer herself as well as eight other close contributors, the book includes testimonials from the company’s dancers, and offers an intimate window into Chouinard’s creative universe. Visit www.mariechouinard.com to purchase a copy of the book, or to find out more information about the company. 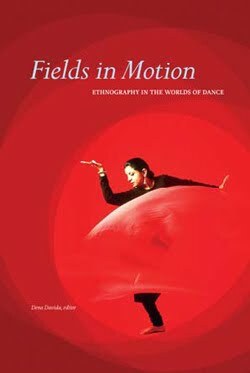 Finally, the release of Fields in Motion: Ethnography in the Worlds of Dance is forthcoming in September after eight years of hard work. Edited by Dena Davida, artistic co-director of Tangente in Montréal, the authors include fourteen Canadian contributors and fourteen contributors from around the world. Published in Canada but with an international perspective, this collection of essays explores the art of dance as cultural practice, revealing the significance of the art form in our contemporary society. Students and dancers take note – a paperback edition of Fields in Motion: Ethnography in the Worlds of Dance will also be released for a more moderate price.